Tonight was the West Coast premiere of HAPPY, a documentary by Roko Belic. Thanks to the efforts of our own Paul Turner and his lovechild Darkside Cinema, we got not only the movie, but a chat with the Academy-nominated director. He's here tomorrow as well. If you want a chance to see a man and his dream in motion, pop in for the 7 or 9 pm Saturday showing. If you can't make it then, you'll have three more weeks to be among the first to see this inspiring film on the best part of the American Dream. After the show, I went out for some slow food and good chat with friends. We talked about times we felt in flow (more on this next post). I remembered a great night in Summit where all the requisites for my personal happiness were present: community, celebration of life milestones, family, good food, music, nature, physical activity (in this case, dancing in the barn). And recalled another beautiful evening with photographer friend Maria and her foodie musician friends, dining on four courses and telling tales of great food adventures throughout the world. Food is as democratic a road to happiness as any. In the documentary Happy, a seriously happy Cajun family chows down on a tabletop feast of fresh crab; a few scenes later a Bushman family in Namibia shares a fresh kill. Cut to the Dali Lama, reminding us that love starts with that first suckle at mama's breast. As screwed up as our relationship with food can become in a calorie-laden culture, food still brings us together, in celebration and grief. We comfort the sick with soup, celebrate the milestone with sweets. As lovers, we long to feed the other early on, cementing the bond with gifts of physical nourishment. 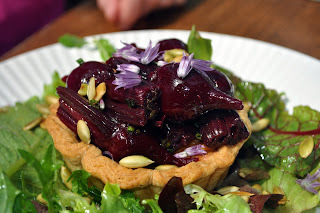 In honor of the primal need to sustain our partnerships through cuisine, I'll start this series of Happy Blogging with a recipe. This was a gift from Dennison Farms with my leek purchase last week, writ by local earthmama Wendolyn Molk (who also bakes a darn good loaf of bread and makes a great peach pie). Done by memory, so please forgive me, Wendolyn, if I have screwed it up. So very yummy I have made it twice. Saute' the leeks on medium-low heat for 30, yes 30 minutes in the butter. If they look like they'll get too dry, cover them. Beat the egg with the cream, throw in the crumbled/grated cheese and add the leeks. Put it in an unbaked crust and cover with the top crust. Because I do not know how to leave well enough alone, I added the fresh morals I found in my backyard (sauteed til slightly brown) and a bit of nutmeg. For additional happiness, serve with friends, conversation, reasonable social risk-taking and gratitude. 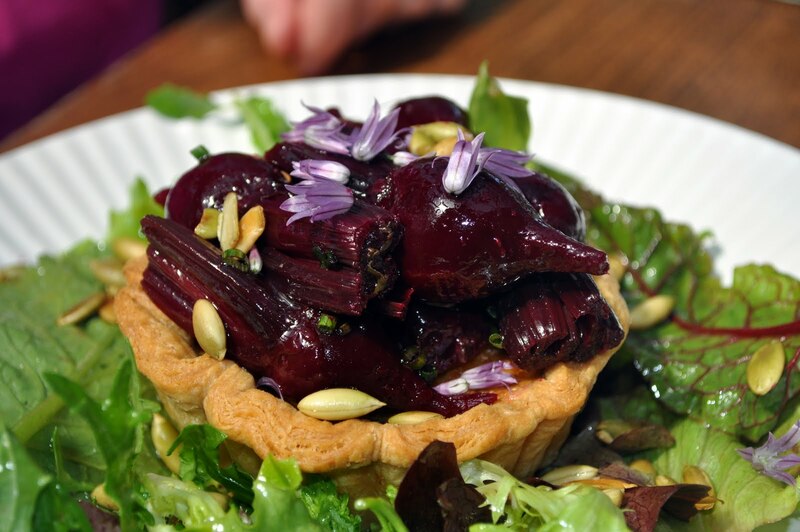 PS: The pic at the top is of a beet and pumpkin seed tart from lunch at the Gathering Together Farm. It was delicious.